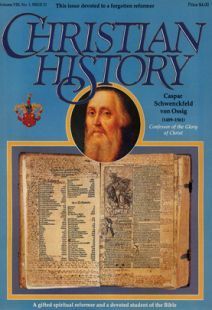 This is the kind of issue we love to do at Christian History—an issue about a figure whom you should know about, but who has been practically forgotten in the shuffle of Church history. Caspar Schwenckfeld (yes, his name sounds strange) was a reformer who fell out of favor with the “mainstream” of the Reformation. He did not wish to found a Church or separate movement; he had no interest in having political muscle behind his doctrines. He wanted spiritual reform—in the inner Christian life. He believed in the purging of error from the Catholic Church, but was discouraged at the small influence Luther’s reform was having on personal morals and individual godliness. (Luther himself lamented the un-Christian lives of many of those who jumped on his reformation bandwagon: many were merely political Protestants.) Schwenckfeld was intensely concerned with the influence of theological ideas on personal practice—on the life of Faith. Until this century, Schwenckfeld’s small group of followers did not claim to be a church. They simply called themselves confessors of the glory of Christ, after Schwenckfeld’s theological emphasis on a glorified Christ. They were a small group with a vital spirituality who had settled in Pennsylvania (part of the so-called “Pennsylvania Dutch” heritage) after being cruelly driven from Europe by intolerant Catholics and Protestants, both of whom rejected them as heretics. Thank God Count Zinzendorf offered refuge to the Schwenckfelders, and has left history a record of mercy, acceptance, and Christian love in a time when, tragically, intolerance among Christians was the order of the day. 1989 marks the 500th anniversary of Schwenckfeld’s birth in what was then Silesia, today part of Poland. There are only five Schwenckfelder Churches in existence today, all in a small area of Pennsylvania. They have been careful to learn, preserve, and keep alive their heritage. As our neighbors, we can almost see the steeple of one of their churches from our offices in the Pennsylvania countryside (trees are in the way). We are glad to honor them and their heritage, on the half-millennium anniversary of Schwenckfeld’s birth, and delight in the opportunity to devote an issue to a subject “near to home,” for our friends. Our special thanks to Dr. Peter C. Erb of Wilfrid Laurier University, Ontario, Canada, scholar and writer, authority on Schwenckfeld, who was an invaluable resource person for this entire issue; to Dennis Moyer at the Schwenckfelder Library, who was very kind and helpful, and who guided us through their amazing collection of rare documents and pictures and let us see Schwenckfeld’s Bible up-close; to Reverend Jack Rothenberger, of the Central Schwenckfelder Church, Worcester, PA, for his assistance at many points in preparing this issue. Caspar Schwenckfeld was a serious student of the Bible. The Reformation of the early sixteenth century was not a single unified movement. Take a trip in a time machine back to Schwenckfeld’s time. A list of eight German states of the sixteenth century.